Platform games on the 16 bit systems were annoyingly common, and a bunch of them did little to seperate themselves from each other. One game that captured the imagination was Decapattack, and was one of my favourite games ever. Released in 1991, it was originally a Japanese game called Magical Hat no Buttobi Tabo! Daiboken, and it was fun, but hardly memorable. I think (and I’m not sure) it was based on a Japanese cartoon at the time. Again, the licence for it didn’t extend outside of Japan, so to release the game, there was a complete makeover. Gone was the hero and his hat, instead it’s a mummy with a detachable head. Yes, years before Dynamite Headdy was Chuck D. Head, a mummy with a detatchable head powerup. Originally hidden in the level, the head is obtained by smashing the scenery (with your second head that emerge from Chuck’s torso). 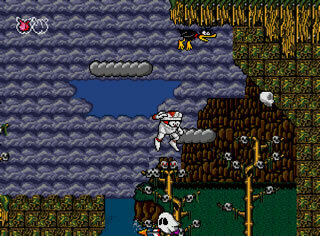 The second head (a skull), can be used for ranged shots, similar to Dynamite Headdy, really. Whilst Dynamite Headdy had a range of heads though, Chuck only had one, but a wealth of pretty standard powerups at his disposal (destroy enemies on the screen, invicibility, that sort of thing). One hit and you “lose your head”, and a bit of energy. Lose all your energy and you lose your life. Lose all your lives and it’s game over. As previously mentioned, the game was based on a Japanese game, with a complete overhaul. Wierdly, this made the game more memorable, as the storyline (which is lost in translation if you get an English translation of Magical Hat) is fairly good, with oodles of dark humour. The characters are brightly, cartoony, yet a little dark, and it’s the same with the music. The music is a rocky, but with a fun over tone, and fits the bill of the game. 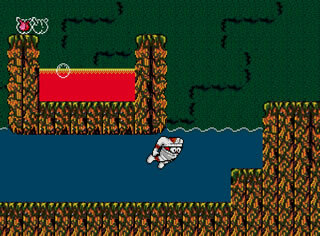 Some levels require you to take to the water, which the graphics do suffer a bit. One thing that isn’t missing from the Japanese game is the difficulty. The powerups are quite sparse in the game, they’re not respawned when you die, and before the end of each level, you need to beat both the end of level boss and an item located within the level. Not found it? Go back into the level and do it again. But I loved the difficulty, the dark humour, the graphics and sound. In the early 90’s though, I was in the minority. One things for sure, now it’s never going to set the world alight. It is just too similar to about a dozen games that were released at the same time, and it showed. The game didn’t achieve a huge amount of success. However, unlike many games of that era, it has stood the test of time quite well, and as a result it’s usually a sleeper hit for Sega now. It’s frequently included in those “Mega Drive” collections, and often one of the top games on there. It’s a solid platformer, with a decent sense of humour, that still looks and sounds pretty decent, nearly 20 years after it was first released. Just don’t lose your head. One of my fave Mega Drive games and one that is rarely championed on the web. Nice review as well.